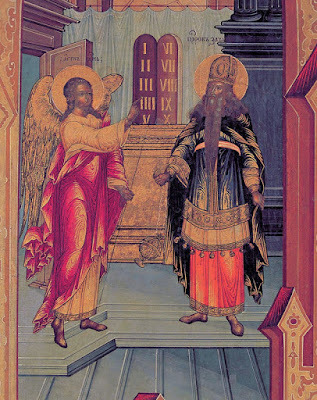 According to the information and preconditions mentioned above, Chrysostom places the altar of incense in the untrodden, innermost and most sacred part of the Temple of Herod, in the Holy of Holies, apparently based on the Epistle to the Hebrews: "He did not say the altar of sacrifice, but the altar of incense. The altar of sacrifice and burnt offerings was outside, while that of incense was inside. "5 Indeed, the Epistle to the Hebrews, which would not make an error in its description since it was directed to the Jews, says: "Behind the second curtain was a room called the Most Holy Place, which had the golden altar of incense and the gold-covered ark of the covenant" (Heb. 9:3-4). According to Professor Panagiotis Trembelas, this reference in the Epistle to the Hebrews regarding the altar of incense in the Holy of Holies "needs interpretation", because this altar was in the Holy Place and not in the Most Holy Place, or Holy of Holies, according to the Old Testament (Ex. 30:6; 2 Chron. 4:19-20; 1 Maccab. 1:21). Continuing his analysis that it was not possible for a second altar of incense to exist, and taking into account the testimony of the apocryphal Apocalypse of Baruch that this altar of incense was in the Holy of Holies, Professor Trembelas ends up with a probable interpretation - that the altar of incense (according to the Old Testament), or the golden altar of incense (according to the Epistle to the Hebrews), or the altar of incense mentioned by Luke the Evangelist, even though it spatially belonged to the Holy Place, which was an "antechamber" of the Holy of Holies, nonetheless "on the Day of Atonement... it appears that it was within the Holy of Holies. "6 This finding may help identify what took place in the Holy of Holies. According to Chrysostom, the physical proximity of the people praying from Zechariah who burnt incense, is another indication that Zechariah was in the Holy of Holies. It is said that the people were ignorant of what happened with Zechariah. "Perhaps he was within the veil? There he received the announcement. "7 Here the following question arises: Is it not possible that Zechariah was segregated or hidden from the people in the Holy Place and not necessarily the Holy of Holies? It is known however that the veil to the Holy Place remained opened. The modern Jewish "Temple Institute", which is an institution that deals with research towards the restoration of the Jewish Temple in order to rebuild this Temple, accepts the view that the daily offerings and all the sacrifices of the priests, were done in the Holy Place with the veil (or doors) open, in the morning.8 According to the biblical text, the Holy Place, in which was the altar of incense, was separated from the inner courtyard (of the priests), where the altar of sacrifice was. Beyond this was the outer courtyard, where the people stood and watched behind a low wall.10 This communication through the open veil also served the following practical needs: coal from the altar of sacrifice was used for the offering of incense in the Holy Place.11 This interpretation of the open veil is based on Leviticus 3:2, where it states that the offering of sacrifice takes place near the Tabernacle of Meeting, as an offering to the Lord: "You are to lay your hand on the head of your offering and slaughter it at the entrance to the Tabernacle of Meeting. "12 (The elevated difference between the Temple and the outer courtyard, where the people stood, warrants a partial view of what took place in the Holy Place). 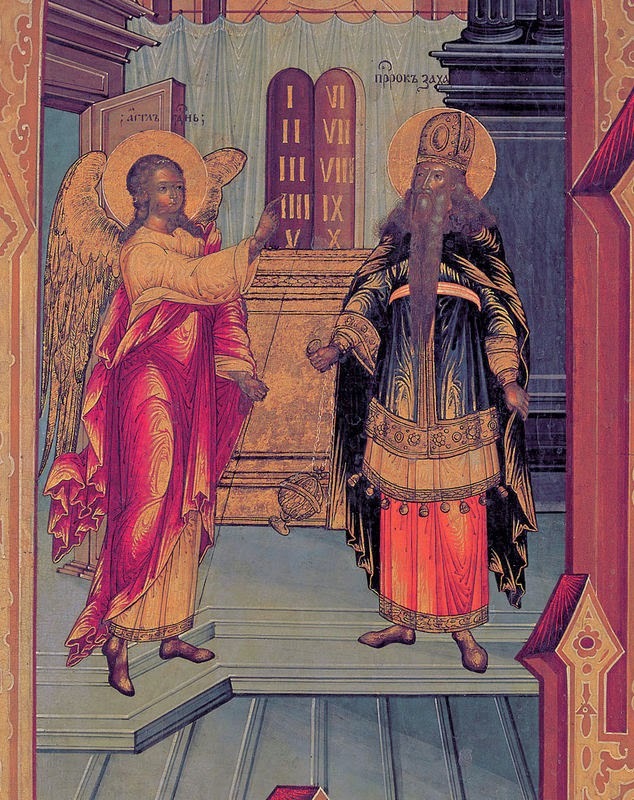 That Zechariah was alone in the Temple, is for Chrysostom a third indication that places Zechariah in the Holy of Holies where he received his announcement. Indeed, the service of the priests and Levites in the Temple of Jerusalem is not clearly and thoroughly profiled in the Old Testament, but it appears that the daily service of offering incense and other sacrifices in the Temple took place by more than one priest. It thus turns out, according to all the evidence, that when the daily offering of incense took place in the Holy Place by a lawful priest, as well as by a lawful High Priest, it was not done by a single priest or by the High Priest alone. Hence, the priestly service of Zechariah in the first chapter of the Gospel of Luke, was not part of the daily service, but the annual entrance of the High Priest by himself in the Holy of Holies, and this is vindicated in the interpretation of Saint John Chrysostom. 5. Ibid. 5, PG 49, 357. 6. Π.Ν. ΤΡΕΜΠΕΛΑΣ, Ὑπόμνημα εἰς τάς Ἐπιστολάς τῆς Κ. Διαθήκης, τόμ Γ΄, ἐκδ. «Ζωή», Ἀθῆναι 1956, σελ. 120. 8. "A Day in the Life of the Holy Temple. The Daily Sacrifice Cannot Begin Until the Gates are Open." (http://www.templeinstitute.org/day_in_life/gates_open.htm). "The act of opening the Sanctuary gates has great significance, for the morning tamid sacrifice cannot be slaughtered and prepared for offering upon the altar until the gates have been opened. In fact, the priest who has been assigned to this task will not commence until he actually hears the sound of the great gates opening. For with regard to the peace offerings, the verse indicates (Lev. 3:2) "... and he shall slaughter it opposite the door of the Tent of Meeting," and the sages have derived that the same applies to every sacrifice: it must take place while the doors are open, and not while they are closed, in order to fulfill the requirement of 'opposite the door'." 9. 1 Kings 6:32-36 (the doors of verse 32 are that of the Holy of Holies). 10. "Ἡ Παλαιά Διαθήκη μετά συντόμου ἑρμηνείας", τόμ. 6 (Βασιλειῶν Γ΄ - Δ΄), ὑπό Ν.Π.Βασιλειάδη, ἐκδ. «Ὁ Σωτήρ», Ἀθῆναι 1988, σελ. 88. 11. "A Day in the Life of the Holy Temple. The Shovel" (http://www.templeinstitute.org/day_in_life/shovel.htm): "It is also the turn of he who received the task of 'the shovel' to now bring the shovel of coals to the inner altar within the Sanctuary for the burning of the incense. First he must take up a silver shovel and ascend to the top of the outer altar, where he will stir the coals to and fro, and take some of the burning coals into the shovel." 13. "On the Epistle to the Hebrews" 11, PG 119, 372B. 14. 2 Chron. 29:6-7. See also 2 Chron. 28:24: "Ahaz gathered together the furnishings from the temple of God and cut them in pieces. He shut the doors of the Lord's temple and set up altars at every street corner in Jerusalem." 15. 2 Chron. 13:11: "Every morning and evening they present burnt offerings and fragrant incense to the Lord. They set out the bread on the ceremonially clean table and light the lamps on the gold lampstand every evening. We are observing the requirements of the Lord our God. But you have forsaken him." 16. "Interpretation of the Epistle to the Hebrews" 9, 9.10, PG 82, 741Α. 18. "A Day in the Life of the Holy Temple. Throwing the Magrepha"